I’ve been jealous of the beautiful photos I’ve been seeing on Instagram and blog posts. You know the ones I mean! Well, this is a quick and easy way to create a DIY Lightbox for beautiful online photos. You can also download “DIY Lightbox- Quick Tips” in my Resource Center below the post. 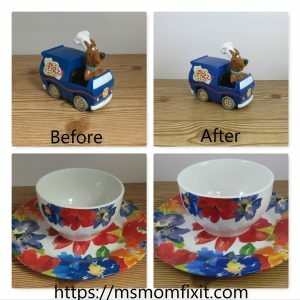 A great way to get picture perfect photos without spending a lot of money is to create your own DIY Lightbox from items you can easily obtain from the dollar store. 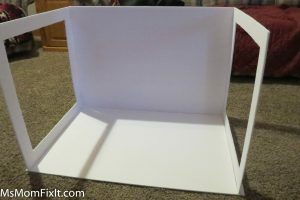 So knowing what I did and did not like from articles I saw online, I created my own “portable” lightbox using methods from several different bloggers. Before we get started, I want to mention that you CAN use any cardboard box from home for this project rather than creating the box yourself. However, the white foam board will reflect the light on the subject of the picture much better and give you a more professional look! 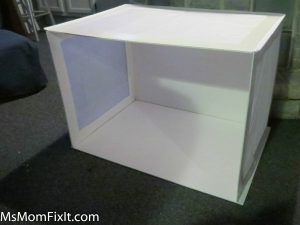 Step 1: For my lightbox, I cut a well about ½ inch from each edge on the sides and back of 2 full pieces of foam board (for the bottom and the top). The well was approximately ¼ inch wide.To create the well, cut only partially thru your foam board on both sides of the well. You can then use your X-acto to dig out the middle. The idea behind the well is that the side pieces will easily sit into the well and block light from entering in unwanted spaces while allowing the box to be portable. Once the side walls are together, the entire box will be 3 flat pieces that can be stored behind a dresser or bookcase when not in use. While this method works well, it was difficult to evenly dig the wells into the foam board. If you decide to use this method, I would recommend reinforcing the back of the well with white duct tape. Step 2: For the top, you will want to create a hole for the light to enter. If you are using a full sheet as I did, I recommend cutting the hole into the same rectangular form 3” from each edge. So your hole would be 14” x 24 “ on a standard 20” x 30” foam sheet. Quick tip: Parchment paper is available in 12″ and 15″ widths. Please check your supply and cut your hole based on your parchment paper! Step 3: For the sides, you will want to cut down 2 foam sheets to 20” x 20”. Again, we will create a hole on each for light to enter 3” from each side. Thus, your square holes will be 14” x 14” on each piece. Step 4: For this step, grab your yet uncut piece of foam core and line it up to the well on the bottom piece. You will want your piece to easily fit into the well. Since we created the well ½ inch from each side, this means you will need to remove approximately 1” on the 30” side making it about 29”. However, you want a little room on each end. So, I would definitely check how this piece fits into the back well before proceeding to attach the sides. Step 5: Attach the 2 sides you created to each side of the foam core sheet in step 4 with the duct tape. Be careful to leave enough gap for the sides to fold completely flat if you choose to store it folded down. Again, it’s a good idea to have the pieces in place in the wells as you tape. You should now have 3 separate pieces of your box (top, bottom, and back/sides). Step 6: Time to attach the parchment paper! Cut 3 pieces of parchment that will cover the holes we created in the 2 sides and the top. 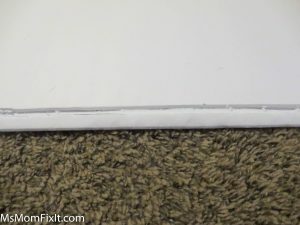 Simply, attach the paper using your duct tape. You may find it easier to attach it first w/ small pieces of tape in 2-3 spots on each side before taping the entire piece down. In my first attempt, I used tissue paper as I anticipated the lighting to be better. While I still believe the lighting on the subject was better with the tissue paper. I found the tissue paper to be too fragile for the constant folding of the box for storage. The parchment paper thus will be sturdier in the long run. Since parchment paper is intended for use in your oven, it also would have a higher burn temperature and be much safer in the long run. If you choose to use tissue paper, you may want to cover one side of it with clear contact paper (which can also be purchased at a dollar store). Just know that it will not be easy to reposition the contact paper if you get any creases as you are placing it on the tissue paper. Creases could create unwelcome lighting effects. Step 7: Assemble your box! This is pretty self-explanatory. Lay your bottom piece well side up on a flat surface. Insert your back/sides into the well. Lay your tap well side down on the top of the back/sides. Your box is complete! Step 8: Position your lighting. Optimally, you want to have 1 light on each side of your box. The best position is generally a slight angle so that the lights meet in the middle of the center of the box. Step 9: Cover the back of your box as desired. You can easily use a large sheet of colored (or white) paper for your “backdrop”. You can also use several types of fabrics. To achieve great results when using fabric, I would recommend nylon or satin as they tend to wrinkle less. Please take several pictures of your subject whether it’s a toy, craft, or jewelry. You may want to reposition the subject a few times and definitely change your camera angle as you photograph. Personally, I like to take my shots at several angles and hold my camera as I shoot. However, if you have an unsteady hand you may opt to use a tripod and change the height or tilt as you shoot. You can, of course, purchase an inexpensive light set on sites like Amazon. However, the reality is that most of us are too lazy to set up and take down the lights consistently. I tend to think most people also don’t have space to maintain a constant studio setup. 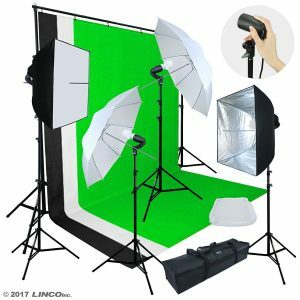 If you have space, a lighting kit like this one is perfect for just about ANY photography situation. You can easily drape the screen over a stool or small table for small items, but the size allows you to create great portraits with perfect lighting as well. I purchased this setup (above) for my son a while back as he wanted to create a Youtube channel. Of course, we didn’t want too much of his personal stuff showing in the background. The screens allow him to be the center of the camera focus. The entire kit easily folds down for storage in a bag that fits easily under his bed. Another great option is a tabletop setup. The smaller size is perfect for photos where you may want to highlight a singular item such as jewelry or a fabulous meal. 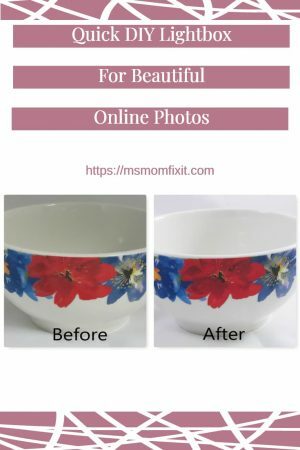 You can certainly save yourself a lot of time editing your photos by creating your own DIY lightbox and achieve beautiful pictures. I hope you will take the time to experiment and let me know how your photos have improved! Here are some photos (cropped only) showing the results! These photos were all taken in a well-lit area. I did not use a background other than the box. I also wanted to give a tabletop appearance so I opted to insert a foam board covered by contact paper that gives a wood appearance. The left side is no flash and no lights. The right side is light filtered through the lightbox on both sides. Just look how much more the white stands out!